The manner in which the Visionary artist evokes the Sacred may differ from painter to painter. In fact, it may differ from one painting to another within one artist's oeuvre. What matters is the underlying vision. In the case of many artists, this is a vision of Unity: the Sacred presents itself as the hidden but solitary source behind all things. It is an experience of shared oneness - difficult to describe in words alone, and often finding outlet instead in images. 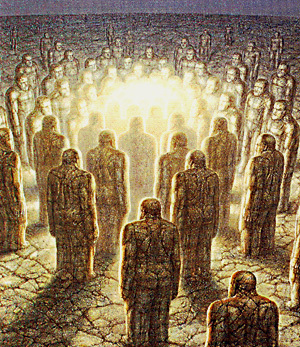 It is for this reason that many of his 'stone men' became increasingly aware of and transparent to... 'light'. They became 'heavy light'. And finally, in the crowning image of his triptych 'The Joining', they became a many-circled gathering around one light - a panel which the artist called 'White Light' or 'Vision One'.